Being a boxer seems like a cool job, right? You get to workout all the time and you get to roughhouse with someone else for a living. Seems pretty legit if you ask us. But getting ripped takes physical strain, dedication, and good old fashioned guts. But if you want your child to be in fighting condition in a hurry, you might not have time for all that. Wearing this boxer costume set will at least make him look like a champ, even if he didn't knock out any other fighters (let’s face it, you probably don’t want him to actually knock anyone out, right?). Just remember that you have to teach him a few moves, like how to duck and weave, before you actually toss him in the ring as the champ. 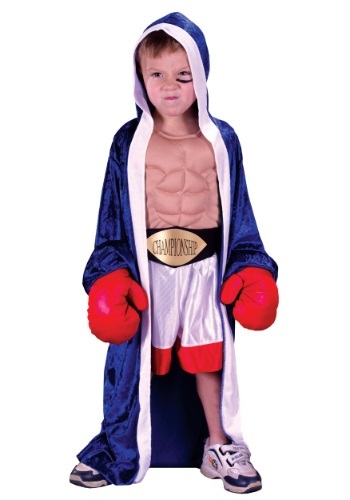 This kids boxer Halloween costume comes with all the necessary items to get them ring-ready in no time. The blue velour robe has white edge bands for the classic boxer look. The sleeveless bodysuit fastens with Velcro at center back for a comfortable fit and the fiberfill padding in the chest will give your child all of the muscles they need without all of the gym time. The included faux leather belt has fabric waist ties and a printed gold champion emblem on front. Add the included red boxing gloves that have stuffed knuckles for a look truly worthy of being a contender.